This building is located on the north side of Broadway near Front Street. weekly paper. 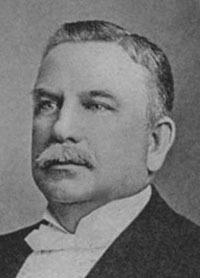 In October 1887, Hastings moved his family of nine to Milton. During eighteen months he made a bare living and decided to give up journalism and move his family to Virginia. Remembering W. P. Hastings and his fearless editorship of the Economist, Samuel Wilson Murray, Chairman of Murray, Dougal and Company, Ltd. (Milton Car Works), purchased the Argus and the Economist to promote the prohibition movement, in which he strongly believed. At the same time, he tore down the frame building that had been built after the fire of May 14, 1880 and built the present three-story brick building shown in the picture, and changed the name of the paper to the Weekly Record; at the same time, he offered the editorship to Hastings. Hastings accepted and came back to Milton in December 1889. In January 1890, the Weekly Record became The Standard.